Screw conveyors are customized. It is important for Van Beek’s engineering team to clearly assess the location where the company’s machine will stand. To improve this understanding, Van Beek has a new tool: the 360° camera. 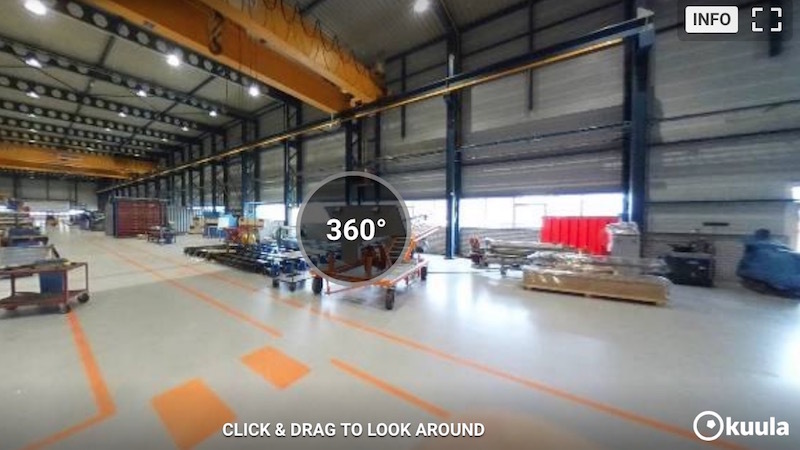 As the name suggests, the camera produces a 360° image of the location. The virtual environment can be seen on a big computer screen and you can ‘look round’ with the mouse or touchscreen. An alternative to the 360° camera is to take a 3D scan. This is an expensive technique where you take a laser scan of the environment. The scan is finally converted into a 3D drawing. “This method is very labour intensive, because it takes a long time to take the scan and convert it into a 3D drawing.” According to Van der Heijden the costs may amount to thousands of Euros. The 360° camera cannot take measure- ments. Previously Van Beek was looking for a technique in which dimensions could be determined from photos. “But these are too inaccurate for our purposes”, says Van der Heijden.